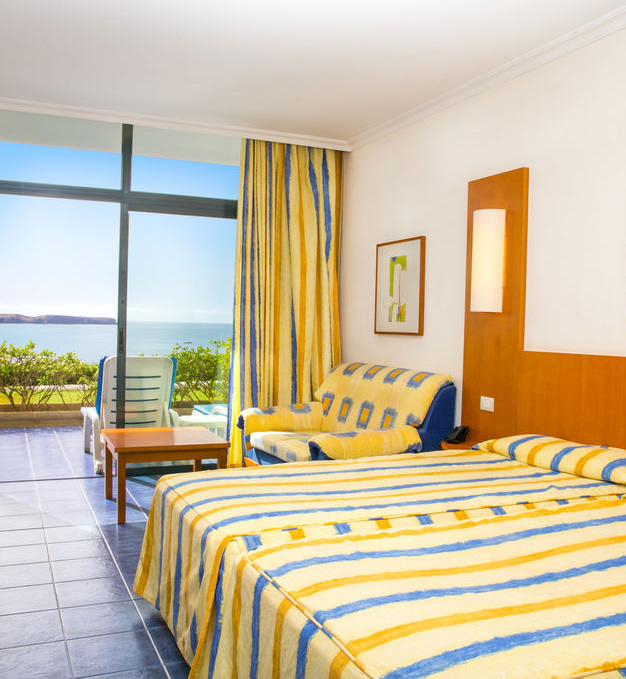 The popular 4 star Hotel THe Mirador Papagayo hotel (formerly the Iberostar Papagayo) is located just outside Playa Blanca and is positioned directly on the seafront at Las Coloradas Bay, the hotel boasts stunning panoramic views of Los Lobos and the neighbouring island of Fuerteventura. The new Marina Rubicon is close by and it is only 3 km from the famous Papagayo beaches. 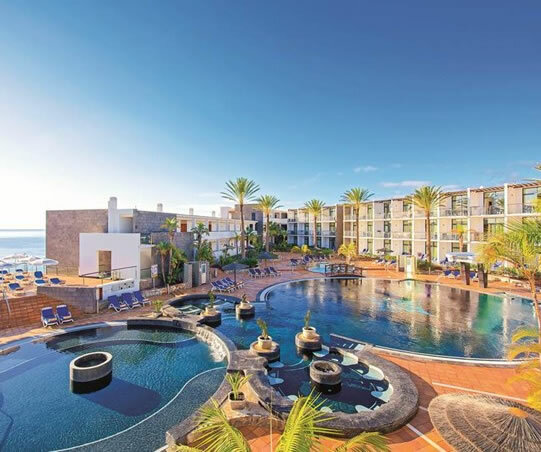 Playa Blanca resort centre is about 2 kms away, here you'll find a good selection of restaurants, shops and bars as well as the old port from where you can book boat trips or take the fast ferry (25 minutes) over to the island of Fuerteventura. The hotel provides 209 rooms over three floors in two separate buildings all rooms come equipped with air conditioning, telephone, safety deposit box, fridge (stocked as mini bar, local charge), television, private bathroom, hairdryer and balcony or terrace. The hotel has 4 rooms for disabled guests and 21 single rooms. The hotel also operate a range of apartments next door suitable for families these apartments are connected to the hotel via an under the road tunnel. Guest staying here also have a choice of board arrangements. Please see our video below for a quick glimpse of this accommodation and its pool. 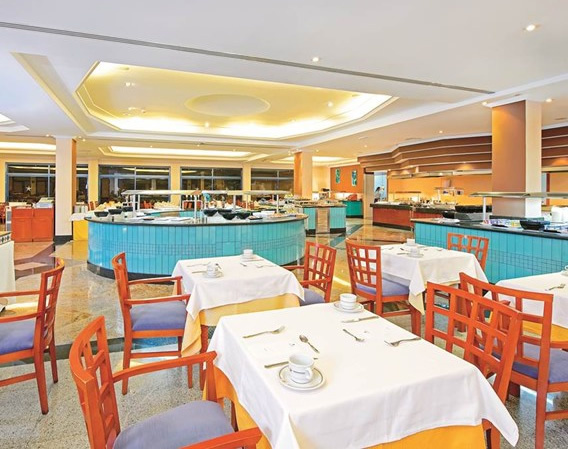 The Hotel THe Mirador Papagayo has a main restaurant for breakfast and evening meals serving both international and local Canarian cuisine. The snack bar El Junco is situated by the pools an ideal position for a buffet lunch. The hotel has the lobby bar Flamenco and in the hotel theatre there is Bar Timanfaya. In the theatre there is a regular entertainment programme with live music and professional shows. For guests staying on the all-inclusive programme please contact us for up to date details on everything that is included during your stay. 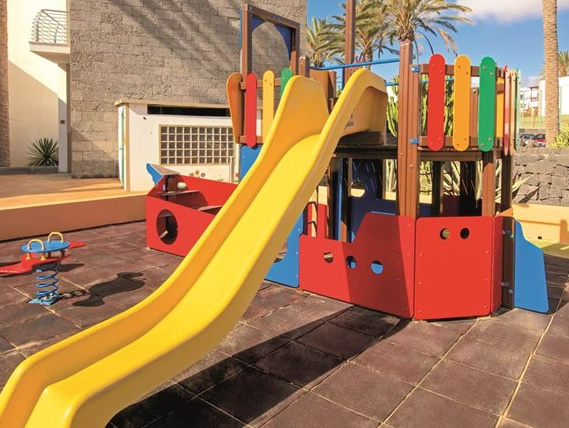 The Hotel Mirador Papagayo has ample space around the pool for guests to relax but if you enjoy keeping active on holiday you can participate in plenty of activities provided by the hotels entertainment team. 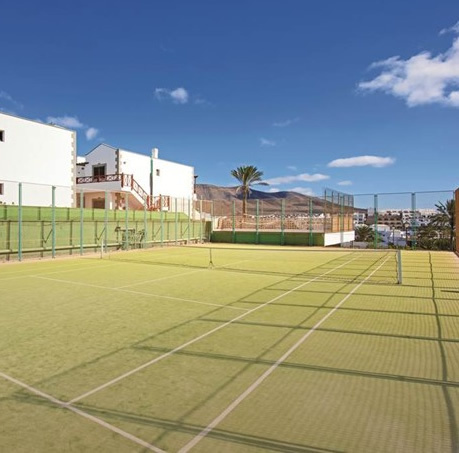 Aerobics, tennis, squash*, volleyball*, aqua aerobics, football, pilates and table tennis.. The islands Golf course is around 45 minutes away and if you would like to hire a bike to explore there is a cycle hire centre only 4 km from the hotel. The hotel also has a Fitness centre with cardio fitness training equipment and fixed strength equipment there is a minimum age 18yrs for the use of the equipment. If you prefer to relax on holiday the hotel has a mini Spa offering a range of services that are sure to achieve relaxation for body and soul. For example there is a hammam (Turkish baths), caldarium, two hydro-massage baths, cold-water baths and various types of massage. Children are not forgotten either there is a mini club for the little ones and a Teenie club for teenagers up to the age of 17 years.